Five articles of impeachment have been proposed by members of Congress who say there are sufficient grounds to act. 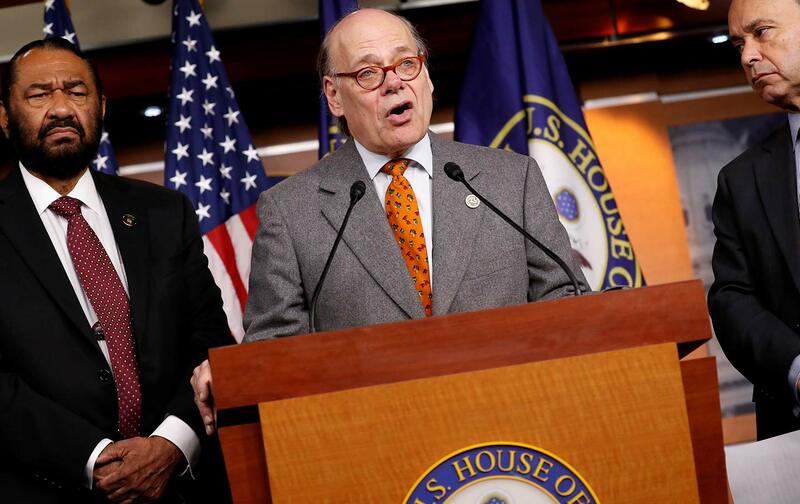 “Given the magnitude of this constitutional crisis, there’s no reason to delay,” Tennessee Congressman Steve Cohen said this week, as he and a group of colleagues announced five articles of impeachment against Donald Trump. Cohen, Fudge, and House Democrats Luis Gutierrez of Illinois, Al Green of Texas, and Adriano Espaillat of New York are calling on the Judiciary Committee to open hearings on executive-branch accountability and the impeachment issue. That won’t go over well with Republicans who control the committee and who, like House Speaker Paul Ryan, remain fully in the service of Trump’s lawless presidency. The proposal for opening the impeachment process will also face resistance from top House Democrats, who have adopted a cautious approach in their resistance to Trump and Trumpism. But House members who have stepped outside the Washington bubble, and who choose to follow the dictates of the Constitution rather than an ill-thought-out imagining of political expediency, are signing on to the latest initiative. “Congress has the power of impeachment when behavior by the President puts the nation and our laws at risk and I think we are at that point, despite the ongoing, important investigations,” says Congressman Gutierrez. Congress needs to step in when there is evidence that the President is interfering with the judicial branch, obstructing or disrupting investigations, or if the President is profiting improperly from his office. This is the start of a long process and it needs to get started now because as a Member of Congress and as a member of the Judiciary Committee, it is my job. While Cohen and others have suggested ideas for why Trump should be impeached, the articles are specific—and damning. Their substance is presented below. National Security Adviser Michael Flynn misled Vice President Pence about his discussions with the Russian ambassador to the United States. Donald J. Trump demanded FBI Director James Comey’s loyalty, and asked Comey to let Flynn go. Donald J. Trump fired FBI Director James Comey while the FBI was investigating Russian interference with the 2016 presidential election, including possible collusion with the Trump campaign. Donald J. Trump admitted in a television interview that he had the Russia investigation on his mind when he fired F.B.I. Director Comey. Donald J. Trump personally dictated a misleading statement for his son and former Trump campaign operative Donald Trump Jr. to use to explain Trump Jr.’s meeting with a Russian attorney who had invited Trump Jr. to meet in order to give him damaging information about Hillary Clinton as part of the Russian government’s efforts to help his father’s campaign. Donald J. Trump refused to divest or place his assets into a blind trust. Donald J. Trump refused to release his tax returns. Donald J. Trump’s attorney has acknowledged his businesses receive funds from foreign governments. An event estimated to cost $40,000–$60,000 held by the Embassy of Kuwait at the Trump International Hotel. $270,000 in payments from the Kingdom of Saudi Arabia for rooms, catering, and parking as part of a lobbying effort at the Trump International Hotel. $30,000 from groups promoting Turkish American relations as part of a convention at the Trump International Hotel. Rents from tenants at Trump Tower owned by foreign states, including the Industrial and Commercial Bank of China and the Abu Dhabi Tourism and Culture Authority. As of September 25, 2017, Donald J. Trump had visited at least one Trump-branded property on 85 days of his presidency, as compared with 164 days in which had not. Pardoning former Sheriff Joe Arpaio for criminal contempt of court. Circulating a video of himself violently wrestling a man covered by the CNN logo. Donald Trump is a threat to our national security and to our justice, and once and for all, we are taking a stand to formally call for his impeachment in the name of our constituents, in support of our Constitution, and for the protection of our Democracy. Trump is dangerous and nearly every month that he has served in office, Americans have witnessed some violation of our values, civil liberties, and access to opportunities that represent who we are at home and to our allies around the world. Mr. Trump is failing and has turned back the clock on the more than 50 years of progress our country has made in civil rights and equality. He has obstructed justice, violated the Constitution, and undermined the independence of our judicial system and the freedom of the press. The evidence is there, and the course of action is clear. It’s time to impeach Trump now. Ed’s note: This post originally misstated Representative Marcia Fudge’s name, and has been updated to reflect the correct spelling.